GLOGIRLY: Do You See What I See? Today my girl and I want to thank you. Thanks for coming to visit us, thanks for laughing with us and thanks for liking us. 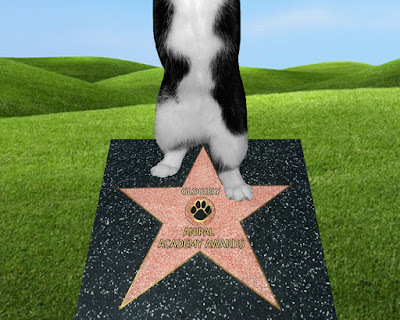 We just found out that we won an Anipal Academy Award Star for our graphic designs! Our favorite ghetto kitty Cathy Keisha nominated us. Knowing CK, there may have been some under-the-cat-tree bribery or strong-pawing going on but hey, we're not gonna cramp her style OR let it dampen our party! 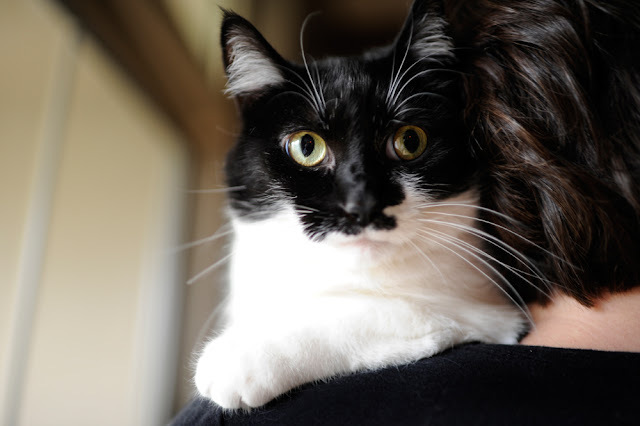 We also found out that we're finalists in the BlogPaws Nose-to-Nose Awards in three different categories. Best Meow Blog, Best Humor Blog and Best Blog Video. 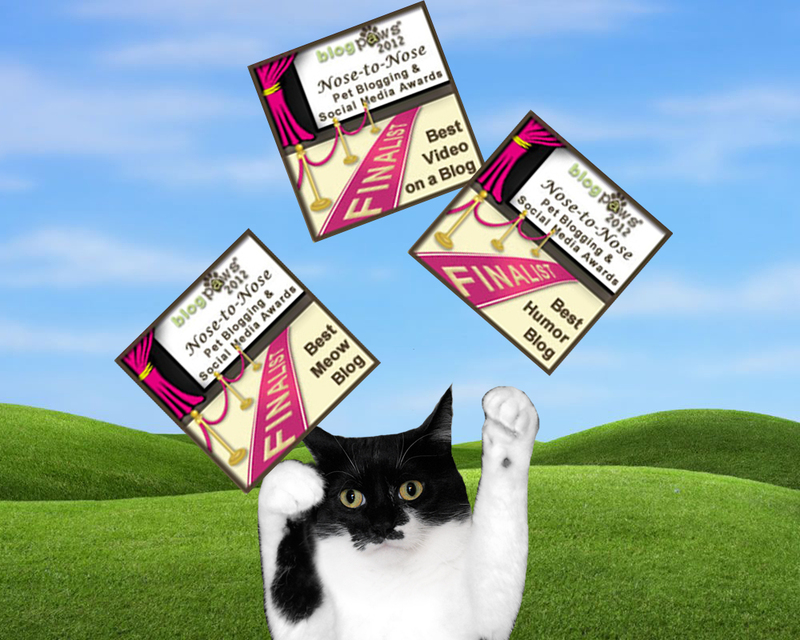 There are LOTS of cat blogs represented in the prestigious list of finalists...YAY! And we are humbled to be named among so many other really talented animals and humans. Did you know there's even an anteater nominated? Awards are fun and it's always nice to know that someone recognizes and likes what you're doing. But the coolest thing in all of this is being able to sit on my girl's shoulder, look out over the blogosphere, and see all of our friends. Each one of you are the reason we're here, just having fun and throwing some smiles around. Oh, just one more thing. That star. I see Glogirly's name. Just Glogirly. Seriously? A rookie mistake. We are sure that was just a mistake on the star. Wow ! congratulations ! Now you can be very proud of yourself ! You are on a roll, Katie, but I have to say, it is all so well-deserved! wow Katie, you are an important STAR! and I think you are lucky to have so efficient secretary in your house! Wow, Katie...Concats on the award for graphic design! That's awesome! Congratulations! You need to fix that star with just glowgirly's name on it. Try to scratch in your name with your claws. I'm sure that will do the trick! Congratulations, Katie and Glogirly! Katie, we're sure it was just an oversight that your name was left off that star...we're sure they're correcting it right now!! We're positive that Star is just a demo and that YOUR name will be on it soon! ConCatulations !! Congratulations - you so deserve it. You do have a great blog. It deserves recognition and so does CK's. And there is always next year. Or maybe you'll each take a different catgegory. Enjoy Blog Paws - I sure wish I were going so I could meet everyone. Clngratulations, you guys! You deserve it because you are so crazy creative! Concats on your star and being a Nose to Noe finalist in so many categories. Let's just say I "know" some cats but I didn't have to twist any paws. Everyone recognizes your vast talents. You may have to change your Twitter account name to @GlogirlyandKatie (or the other way around) to get on the star. Really, it should have been your name--not hers. Humans. CONGRATULATIONS! This is wonderful news!!! An award PLUS you're a finalist in THREE more! Yoo-hoo! YOO-HOO!!! Just look at all those exclamation marks! Y00-HOO!!!!! We are in awe over here - spellbound, you could say. Love your work! ConCAtulations to you both ! Me and mom LOVE to come over and visit you ! Congrats! I hope you win more, y'all rock! Congratulations ans very well deserved! Katie it seems our moms forget w/o us there would be no blog!MOL! Wa -hoo! I like seeing Katie giving you a happy congratulations hug. You both have very nice shiny coats. Concats again and again and again!!! Oh and good luck! And you look mighty fine up there on her shoulder! Wow, that is some accomplishment! Concats! No one in their right mind would ever nominate our blog for those awards! Ahahahaha! ConCATulations, dear friends! That is SO awesome! Congratulations Katie! I don't know how you're name didn't end up on the star. Don't they know who they're dealing with? Maybe they'll get it right at the BlogPaws Nose-to-Nose Awards. Good luck! Great accomplishment - and I did not know about anteaters in this sort of thing. Huge concats to you two. Purrs from our boys. YAY Katie and Glogirly! 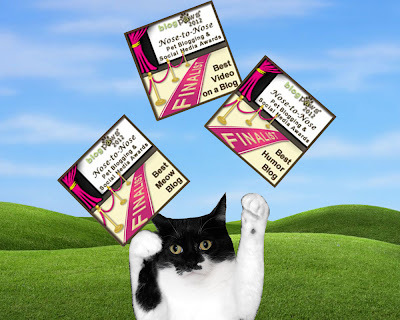 Well, first things first - concatulations on the nominations at BlogPaws...well deserved to be sure. Secondly, Katie, nobody ever looked more elegant and adorable than YOU with the old convict chain/I.D. around their neck than YOU do.....although I totally agree that you "wuz framed I tell ya's"....if you need a good defense attorney lemme know! You're award winning to me everyday!! Me is glad to sees that the rest of the world is starting to knows what we knows! Well done Katie, we think you are very deserving of these awards!